Competitors race in to the water as part of the Noosa Summer Swim, a high profile event that brought hundreds of visitors to Noosa on a wet weekend. FEW events for ocean swimmers offer the chance to pit themselves over 5km alongside current Olympic swimmers. But the Noosa Grand Prix, one of the main events on the Noosa Summer Swim two-day February 2-3 program encourages all comers to push their limits. That's why the Noosa Summer Swim is on so many bucket lists with its festival atmosphere that sees Noosa Main Beach deliver year after year. 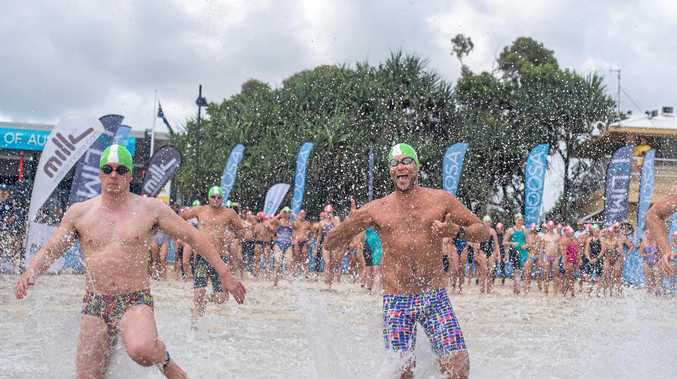 In 2019, the weekend festival will again offer a range of distances for every ability, with thousands of Queenslanders and special guests for a huge weekend of sun, surf and swims. The event kicks off with the Noosa 3km where all swimmers are able to choose their own wave start group while the Noosa 2km is the most popular event on the program. The course takes swimmers out and back from Noosa Main Beach towards the Noosa National Park. "For those taking on their first long course event, there is an option to start with friends and other weekend warriors in the mates' wave,” an event spokesman said. He said the Noosa 1km event is an ideal stepping stone for longer distances or for novices to conquer your first open water event, while the Junior Giants 300m and 1km are a great opportunity for kids aged 8-16 years to acquire a taste for ocean swimming. "We also encourage family and friends to share the experience and swim the course alongside the kids in the 300m dash,” he said. Sunday's 5km marathon distance swim hopes to emulate the 2018 event where the Noosa Grand Prix was contested by some of Australia's most talented pool and open water swimmers as well as international guests. The men's race was a tough tussle won by Nick Sloman in a time of 46.19.4 just seconds ahead of Lachlan Colquhoun. Sloman was the bronze medallist in the PanPacs Men's Open Water 10km. The 1.5km Social Swim is one "hot lap” of the Grand Prix course and is a chance to swim a different course format from Saturday's events. It allows swim fins or other swimming aids.